Hatters midfielder Pelly-Ruddock Mpanzu is determined to break his duck for the season now that team-mate Glen Rea got off the mark on Easter Monday. Mpanzu remains the only outfield first team player without a goal for the club this term, barring deadline day signings Jake Jervis, Flynn Downes and Lloyd Jones. We’ve got to keep pushing ahead and we want to finish top three, promotion is the main goal, so we’ve got to keep winning. His last strike came on April 22, 2017, netting in the 2-1 win over Notts County, although he almost found the net earlier this week against Mansfield, denied by the legs of keeper Conrad Logan. 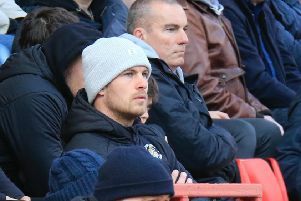 On his performance against Mansfield and the manner in which started assuredly before going through the gears after the break, driving forward to create the chance for James Collins to equalise, boss Nathan Jones said: “How we play, we like people to keep it simple and move the ball on. “He did that, he was a big part of us doing that, but then he really showed his power late on, created one goal, almost scored another, but actually could have created another as if he’d have just squared it, Collo would have got a tap in. “So those are the things that we’ll still be working on. He was magnificent, but as were most of them if I’m honest. “There wasn’t a bad performance in the team, they all stepped up, they all did their jobs, and I thought we looked a real good team again. Mpanzu, who is Town’s longest-serving player, was part of the side who won promotion from the Conference back in 2014 and can see similarities between then and now, with Town close to achieving automatic promotion to League One. He continued: “When we were in the Conference, we came back and stayed top. “We’re not top now, but the feeling is the same, we’re getting closer and closer. Town have done it the hard way in recent weeks, held to a number of draws and they had to come from behind against Mansfield before recording victory on Monday. “Colchester was 2-0 and was a bit of a struggle, but this one was 1-0, then 2-1, so it’s battling performance. “We know we’ve got some characters in our team, everyone’s contributing and 2-1 was a good win for us. Hatters are back in action this weekend at Yeovil, as Mpanzu added: “The season’s not done yet. We’ve still got five games to go, Yeovil is another big away game. “It’s another hard game, every game in League Two is hard, so we’ve got to go there with the right mentality and hopefully get the three points. “Hopefully can go there and get three points and the boys can stick together.